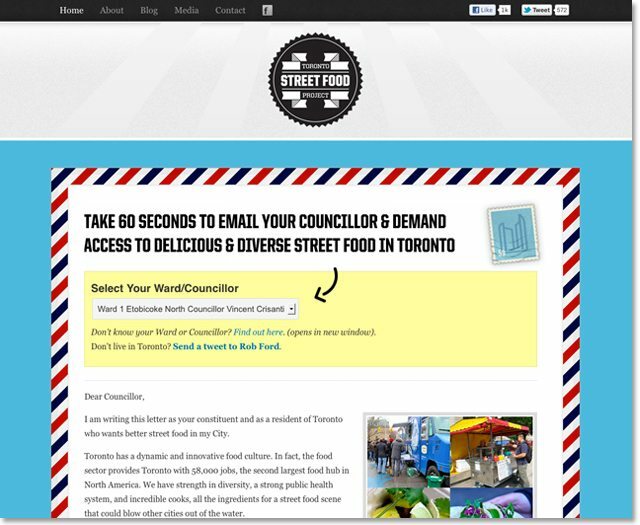 And The Toronto Street Food Project is looking to connect taco-loving social media fiends with city council. A new social media campaign aimed at food-loving Torontonians and the councillors who can liberate street food from its bureaucratic shackles. “As someone who just returned from Food Truck Town (Austin), I say go forth Toronto. TACO TRUCKS,” tweeted one food-truck-loving Torontonian. The public desire for non-franks-and-fries-type street food in Toronto appears to be going strong, but political will is another matter. A new social media campaign called The Toronto Street Food Project (TSFP) is looking fix this, and connect the people with their politicians to bring the dearth of food trucks to the forefront. Mark MacDonald, a freelance web designer by trade, worked for a former city councillor for four years. Armed with an insider’s knowledge of the ins-and-outs of council, he decided to join forces with a group of like-minded foodies in December of last year to tackle Toronto’s dismal street food scene. Two months ago, the Toronto Food Trucks website was born. Ramping up those efforts, this Monday MacDonald and his cohorts (which include food lawyer Carly Dunster and Toronto Underground Market founder Hassel Aviles) launched the TSFP to try to ease the by-laws that are suffocating the Toronto street food scene. It’s not just that food trucks provide good eats; MacDonald explains that they create opportunities for employment, as well as showcase Toronto’s cultural and culinary diversity for tourists. Food trucks can also give car-bound suburbanites increased culinary choices. “Hopefully a more vibrant street food scene will allow these people to have options closer to them,” he said. Remember these? The last time the City tried to manage street food, we ended up with a rapidly failing food cart licensing system that strangled proprietors in red tape. Photo by Miles Storey/Torontoist. The campaign leans heavily on social media tools to allow people to quickly and easily contact their councillors. It appears to be working. The Twitter hashtag #streetfoodto has collected over 1000 tweets this week alone, with councillors Josh Matlow, Shelley Carroll, Paula Fletcher, and Josh Colle already responding to and re-tweeting constituents on Twitter. Over 1000 letters have also been sent to city councillors since the site’s launch. 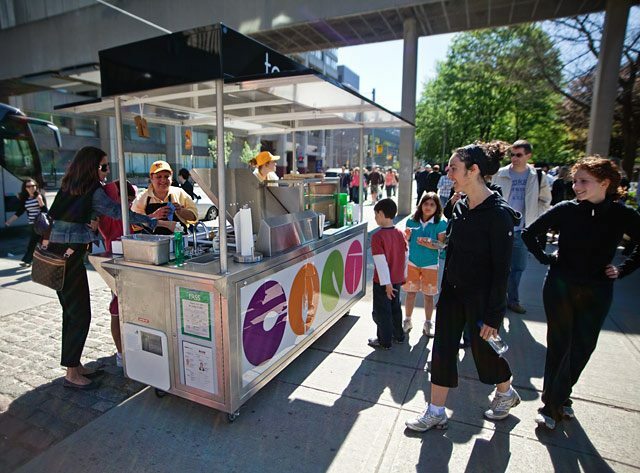 Colle (Ward 15, Eglinton-Lawrence) has confirmed that he will be putting forward a motion at the next Municipal Licensing and Standards committee meeting on April 26 to tackle what he sees as “silly hurdles” barring food trucks from flourishing. The fight’s not nearly over yet. The TSFP is looking to drum up further awareness before it shifts gears into trying to translate that support into action. In the meantime, Caplanksy’s is serving chicken and waffles at the U of T Scarborough campus today, so really, what are you waiting for?